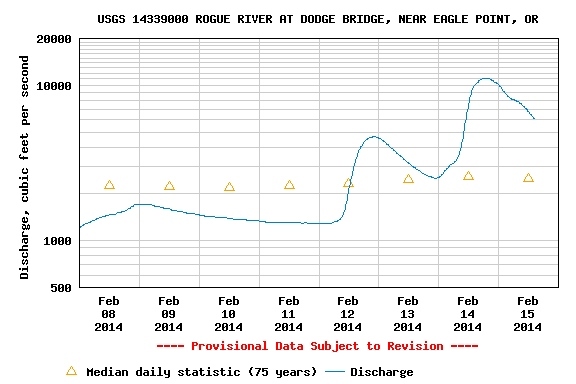 It’s here again, though the flow is a little high for fly fishing at 3150 below Dodge Bridge. One of my all time favorite recipe for steelhead fillets. Floor, egg, instant potato flakes and fry. Um, um good! Rogue River at high flow. High water dropping, but expected to go up again. Early September is a good time to hunt mountain quail. The coveys are large and numerous then. Also a good time to keep your eyes open for deer sign. Mountain quail dipped in a buttermilk, flour and spice mix, fried and served with cornbread. Spotting the blacktail bucks. Early September is a good time to pinpoint their location. A full dutch oven of Deer Camp Chili. The graph shows where the recent rains have bumped the Rogue River water flow in CFS. widget with it’s graph found in the right hand column of this page is a good place to track the flow. Scroll down to find it. Meanwhile wild harvest from the Fall sustains through the rain fronts. Found a great recipe for quail on the Food For Hunters blog. It is called Buttermilk Fried (mountain) Quail, and I can highly recommend it. Rick and Jen hail from Nebraska and are quite active with their blog. I’ve found and tried a number of the tasty “wild” recipes they have catalogued. And I would be remiss in not mentioning one of my all time favorite winter venison recipes. Deer Camp Chili is from Field & Stream I’ve been enjoying bowls of this simple chili dish for years. Want to take the edge off a cold February or March day and there is nothing better going than Venison Deer Camp Chili. It was back on Wednesday the 12th that I caught the last summer steelhead. The recent series of storms with rain have brought the Rogue River up into unfishable conditions. Good because once the rain and river subside the door will be open for targeting the Rogue River winter-run steelhead. For right now, all but the upper most sections of river are blown-out and unfishable. The Rogue River Flows widget in the right-side column of this page goes to the Rogue Basin Teacup Diagram graph which gives water flow data at various locations along the river. A click on the map will bring up the information. 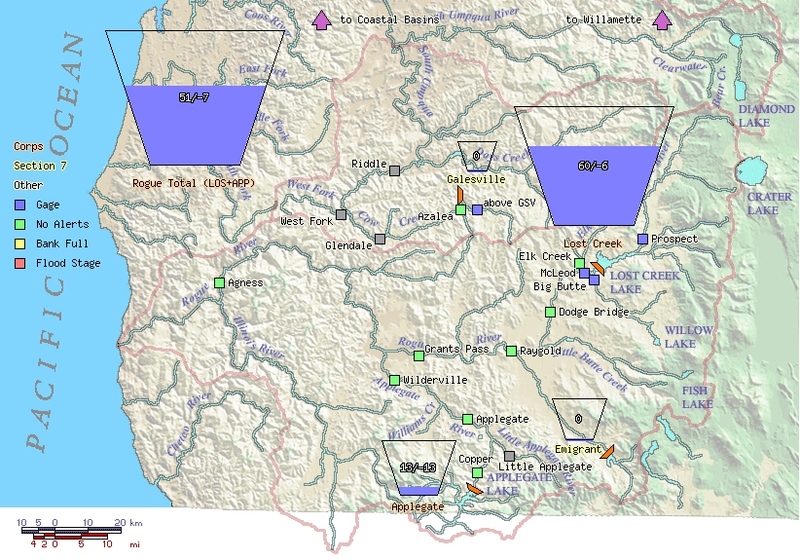 Click on this icon in the right side column of this page to access Rogue River water flows. True winter steelhead may be just weeks away from entering the upper Rogue River, but if there is one thing this winter’s low water of January and February has shown is that there are always some steelhead around. Summer, fall or late fall fish (whatever you want to term these steelhead) arrive earlier than the true winter run. Normal first of the year high water conditions makes them impossible to fly fish for, and that same high water also pulls them up readily into the many small feeder tributaries to spawn. This year, to this date, the river flow has remained mid-fall like with very few high rain episode. The fall fish have remained around longer. Now that is not what I was out seeking. With recent rain I was looking for the advance guard of the large, winter fish. After that recent high flow had rescinded I fished and was happily pleased with the results of the outing. While not winter run, these steelhead were pretty fresh and active. Landing a Rogue River steelhead after a long swing of the fly. The Brown Fork Tail Prince Nymph indices a bite. This has been a good fly this year. When you have success in low water, you should always try for another fish. A beaver’s handiwork along the Rogue River. Just to show how a good, fresh February summer steelhead cooks up…poached whole fish. Serve with a creamy, morel mushroom sauce.